This is Ryan's coin. He was the son of a friend of mine. He passed away and 2/20 was his birthday. I sent her the coin for his birthday so she can pass it forward and follow the story of her son's coin. 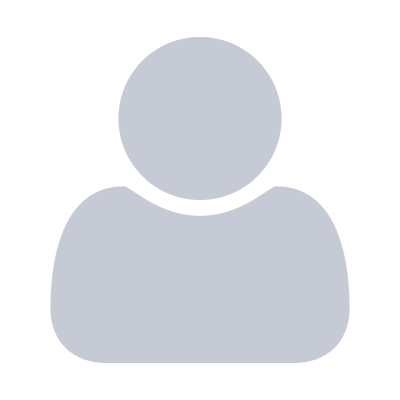 We know each other through Facebook and have never actually met. Coin released at Metro Diner on March 3, 2019, ready to fly and start its journey! Sending this coin to my daughter in Reno, Nevada with a book. Know she will keep our beautiful butterfly moving on and flying high. There was a event to raise money for kids high school sports and this coin was included in a gift basket that a kind person won in a auction. This coin was given to me by my new friend, Donna, in Houma, Louisiana. I am heading back home to Newport, TN to find the right person to give it to! I hope to be a blessing to whoever receives this next! Coin xmff waiting to be released to fly! Coin xm92 waiting to be released to fly! I received this lovely coin from my Facebook friend, Dorilee. I'm not sure WHY she gave it to me, but I feel very honored. I had an abusive childhood. I was able to overcome that with the help of some wonderful people and lots of perseverance. I now try to make life happier for others, especially those having difficult times. I try especially to honor our veterans, particularly those in nursing homes who need help. I hope to do a special kindness for another and pass this Butterfly along so they will pay it forward. Thank you for being my friend, Dorilee. This was a gift from Christmas from my sweet sister in law. I was so happy to get this coin. I lost my mom recently to lung cancer, and to say the least when I got this it made me cry happy tears. My mom loved butterflies and even wore one around her neck since I was little. It totally made my day. Now I'm going to send it on to someone that hopefully it will make them feel the same joy I did. Traveling from Joplin, Missouri. This coin begins its journey with one of my best friends, Scott Beals. He is a man of immense talent and a huge heart. You rarely meet anyone throughout life who is as generous, friendly and wise. I'm sure Scott will smile when he receives the coin and he'll immediately begin to think of who needs an "Act of Kindness." The question is, who doesn't! And that's the beauty of this project, we get to encourage, inspire and track one of the most important things in our culture... helping others when it's least expected. Scott is kind and generous to everyone he meets and he's always lending a helping hand. I have a feeling this coin is going to bless many many lives throughout it's journey. I would like to honor Ms. C. (Leah Carrigan) with these "flamazing" hands. I look forward to the mornings that she spends in the library working with students who benefit from a little extra reading instruction. Leah teaches using encouragement, consistency, love, and of course a little humor! I received the beautiful Monarch butterfly coin when I was teaching a young man how to bead a snowflake. :) It'll be hard to pass it on but I will. Received this coin today as a 60th birthday gift from my Aunt Pat. I started collecting/raising/releasing monarch eggs from milkweed that had spread to our lawn from our sloped area. I knew they'd get mowed over so I got some information on how to raise them from a friend who also raises butterlies and silk moths as well as internet sites, I plan on giving one of the coins to my butterfly friend. She is a very nature oriented person as am I, a kindred spirit. She and her daughter are two of the kindest people I've been fortunate enough to know. Thank you to my Aunt Pat for finding such a unique birthday gift idea! Jeff made a donation to our Feed the Knead fundraiser to get bakery equipment in the hands of people doing good work in our Denver community. Thank you, Jeff! I am an abuse survivor. It took a lot of butterflies over the years to lift me up. I never felt like I truly thanked them all. Now that I am free and giving back, and most of my friends do, This is a wonderful way to truly honor the Spirit of giving back. Thank you. The first butterfly took flight this morning. This coin begins with me. A truck driver, a Geocacher and an all around Awesome guy. This coin is for my collection and to share with others via online media. I am passing the kindness coin on to someone who is constantly going out of her way to help everyone that she can. She puts so much joy, happiness, and kindness into her classroom as well as into our school. She is such a great addition to the school community. She is great at lending a listening ear as well as bouncing curriculum and classroom ideas off of. Thank you for all that you do! Given to a special woman who has saved my life more than she will ever know!! I received this coin from a nice lady who donated food to a food collection that I was volunteering at for the federal workers who were not getting paid. That was over a month ago. I didn't forget about doing a random act of kind, but when I did, I didn't have the coin on me. So, I planned one. I have a colleague who has an amazing family that blesses other people in so many ways, not to mention my colleague has to put up with me! ;) So, I got a few gifts for my colleague's family and put the gifts on their desk with a note and this butterfly coin. To the lady who gave it to me, thank you! I loved thinking about this and passing kindness on! Blessings one and all! I received this coin from my loving and kind hearted sister. I will pass this coin along to a person who demonstrates a random act of kindnesses. Love you Jan. This coin is one of many I purchased in memory of my mom, perhaps the world’s greatest butterfly fan. She was also a woman who engaged in many acts of kindness and this coin is now in the hands of my brother, who lives his life being kind. Flutter on, coin! I purchased the Monarch coin because I really like the idea of "Pay it Forward". I have always picked up gifts for my little sister here and there, because I want her to know how much I love her and think about her. She is taking a trip to Italy soon to visit friends, I felt this would be a great place to spread the joy of the butterfly coin. Can't wait to see where it goes. I am the second recipient of this beautiful butterfly coin. I received it from Dee Dee Van Cleef because of all the kindness I have shown to feral cats and kittens over the years, including having about 30 of them spayed or neutered. I am giving this coin to someone new to Tobin. She lights up any room with her joyful energetic personality and sweetness. She is always willing to go above and beyond for her students and our school community. We are so lucky to have her! I was given this coin by a friend who lent me money to get my car fixed.This woman is like family to me. Without her friendship in my life I would be lost. I love her and I'm eternally grateful that she is present in my life. Given to a friend who has a heart for helping others to cope with mental illness and addictions addiction. Despite her own challenges, she is a light to others to Never Give Up! 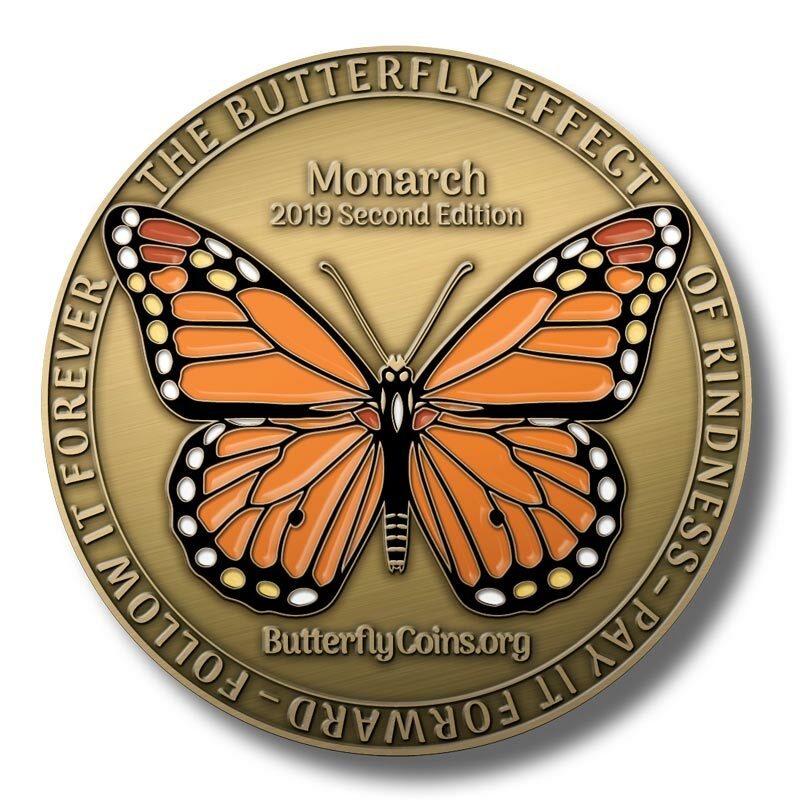 I started this coin's trip by giving it to a wonderful butterfly raiser/supporter who tagged a monarch on February 8, 2019 in Port Charlotte, FL. Tag 0098C from South West Florida Monarch Monitoring Program. This monarch found my little butterfly bush 7 miles away up the Peace River on March 2, 2015. We have been great friends every since. Genny got me started with raising and releasing monarchs, which has snowballed into about 50 other people also helping the monarch!!! Isaac helped me save a lot of extra work in an excel file by helping me create formulas that will allow us to automate a manual process in our tracking of reports. His ten minutes of time saved me hours each week in manual inputs. AK-47 I believe you gave me this coin this morning at the store. Thanks for taking my cart. I passed it on to my 88 year old father. He was delighted and is taking it to Saint Thomas Aquinas in Saint Cloud where he will pass it on to one of 2 women that help him at the church on a daily basis. Sending this coin to my niece on her 60th birthday . Last year she started planting different plants to attract the monarchs and help them on their migration . She would collect eggs from the plants , hatch and release them. I think she deserves this coin for her love and concern of all living things! Happy Birthday, Julie. The DailyBee stop by our fundraiser event "The Power of Community" to say hi, take pictures and honored me with the beautiful gift of my Butterfly Coin. It was my honor to serve my community that serves me. I'm blessed and thankful. Excited to pass my coin along and see where it flies. Blessings to all. I received this coin on behalf of my future son-in-law Alex. I like to thank him once again for bestowing this beautiful butterfly coin and the honor that it carries upon me and thanking me for all the things I've done for Alex, Kimberly and my beautiful granddaughter Charlotte ... that's what families do they look out for each other, take care of each other and most importantly love one another...! Thank you to Hilarie for the beautiful butterfly coin! Hilarie, you are the best. Thank you for your support in spreading kindness throughout the Colorado Springs area. I hope it spreads kindness far and wide! My sons girlfriend Allie's dad Tim was visiting us in Texas and lives in Minnesota. I thought it would be great to send a butterfly coin in that direction.